Posts are going to be a bit scarce over the next week or so (and then depending on how long it takes to get internet at my new place). Yes! My new place! As sad (and trust me, I’m sad) to leave my beautiful house, I have to because my landlords are moving back into town from their year at Harvard. For some reason they want their house back (I can’t imagine why, I mean, the place isn’t perfect or anything), so I’ve been on the hunt for a new perfect situation. I’d been planning for a month or two now on moving in with friends to their house, but just this past weekend the opportunity arose to move to a cabin. Yes, a cabin. A cabin! A 150-year-old cabin in the woods, part-way up the mountain (but not too far out of town). A cabin with electricity (thank heavens) with spring water and a wood burning stove. A wood burning stove! (Do you know how long I’ve wanted to live somewhere with a wood burning stove??) Oh, and the kitchen is relatively huge. Pictures to come, but first I need to get the key, clean the place up, and move all of my stuff in by the 15th (which is oh-too-soon). So, dear readers, this blog will morph into vegan mountain living or something. Oh, and I’m going to get a dog. Too much excitement all at once! Also exciting? The Lebanese Festival this past weekend! 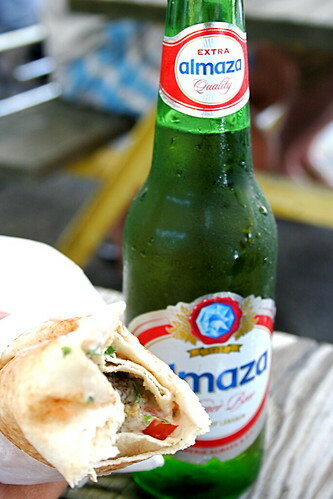 Ok, actually the festival was tiny and not all that exciting, but I was able to score the best falafel I’ve had in ages & an overpriced bottle of Lebanese pilsner, Almaza (which was surprisingly good–had no idea there was a Lebanese beer). Both were perfect for the hot, muggy day. Roanoke needs international festivals more often! 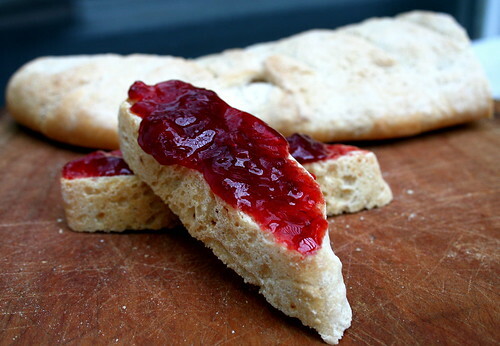 In other news, I’ve been gnoshing on these preserves lately (spread on Reinhart’s French baguettes, of course). I seriously can’t get enough of the stuff. Made out of fresh, local strawberries, turbinado sugar, and orange blossom water, the recipe is oh-so-simple and oh-so-good. It’s the perfect spread for afternoon tea or a snack with your morning coffee, and, given that a quart of strawberries produced just over a pint, it’s the perfect recipe for anyone who wants just enough for themselves (yes, I’m being greedy with this one). Early summer has never tasted so good. In a medium-large pot (I used my cast iron dutch oven) over low heat, cook the sugar and lemon juice until a syrup forms (about 10 minutes). Add the strawberries and orange blossom water and increase the heat to medium high. Bring the strawberries to a boil, the lower the heat to a slow simmer. Cook until the preserves begin to gel, 45 minutes-1 hour (mine took about an hour). Use immediately or follow proper canning guidelines. Good luck with the moving! I can’t wait to see pics of your cabin. I wish I could live in a cabin, way out in the woods! I’ve never made my own preserves before. There is always an abundance of strawberries hanging around my fridge during the summer, so I shall have to give this a try. I’ve always wanted to live in a cabin. Share your place with me and we can drink bear and eat preserves all day long! (Okay maybe just once a day…). a cabin and a pooch soon?! hellz yeah, Jes. i’m super excited about both! vegan mountain awesomeness. yay! i can’t wait to see pictures of your new place, and hooray for falafel goodnesses and deeeelicious preserves. i got some blueberries this past weekend at the market – went ahead and froze ‘em up, but now i’m all inspired to create some preserves. your strawberry orange blossom preserves look ever-so tasty and perfect for summertime! i should really get some orange blossom water, and come to think of it, i’d like some rose water as well. OOoohhhh a cabin!?!?!? A real live cabin!?!?! You are SO lucky, and I can’t wait to see pictures. It is so my dream someday to live in a tiny cottage out in the woods somewhere. I am thrilled for you! Yummm! Lebanese food is delicious, but not as delicious as those preserves – I bet those are scrumptious! Mmmmm! I love orange blossom honey so I can only imagine how good this must taste! Whooo! Congratulations on the awesome move! I am so jealous, but in a good way, not in an evil way. I would love to live in a cabin in the woods! And a dog? How awesome! Of course, you have to have a dog if you live in a cabin in the woods, it’s just how it’s supposed to be! I am looking forward to seeing pictures of your new kitchen! That looks so good- I bet it would be delicious on some toasted bread with peanut butter! Oh that’s so exciting!! A mountain cabin vegan! And a dog..woot! I just got the Bread Baker’s Apprentice..can’t put it down. If you have any suggestions on what to try first, let me know! What a great find, Jes, a cabin in the woods. There is nothing like a woodstove to top it off, and a dog, too! Best of luck to you – a little Walden in one’s life is a good thing. Love that garlic scape pesto, btw, I know now what I am going to do with mine. A mountain cabin! Wow, that sounds so cool! Congratulations! Can’t wait to see the pics after you’re all moved in! Do you already have the dog picked out, or is it just something that you thought would go along with living in a cabin? Hope you make out well!